I am somewhat looking forward to winter because of the holidays and I love sitting by the fire watching the snow fall. However, there is one thing I don’t like about winter and that is my dry skin. My hands are normally fine all year until about October when it starts to get really cold. My hands get so dry that they crack and bleed. It is almost like the moisture is being sucked right out of them. I am constantly moisturizing to keep my skin soft and healthy. Today I want to tell you about a product that I have been trying for awhile now. It is Caprina Fresh Goat’s Milk Body Lotion with Marigold Oil. 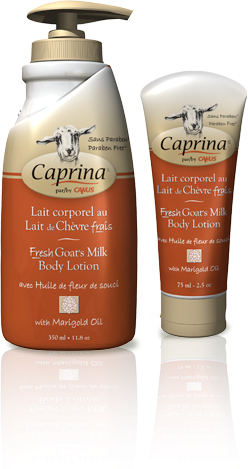 As with all Caprina products, it is made with fresh goat’s milk. I love goat’s milk because it is very gentle on my sensitive skin and it really does moisturize great. Goat’s milk actually has smaller molecules that are easily absorbed into the skin and its rich in emollients. I have been using it mainly on my hands and arms which are my main problem areas right now. It’s been working fabulously and I can say that I have not had to deal with any cracking or bleeding. I also love that it is not at all greasy and one application will last you for the entire day so there is no requirement to keep reapplying. It smells nice too! John used it on his arm after he got his tattoo and it really helped to keep the area moisturized and he had no problems with scabs after his tattoo. It was also very gentle on his tender and sore skin. Caprina Body Lotion comes in five fragrances: Olive Oil & Wheat Protein, Marigold Oil, Shea Butter and Orchid Oil. It is available in a 350 mL family size for $9.99 or a 75 mL travel size for $3.69. You can find Caprina products across Canada at all major drug, pharmacy, mass merchandiser and grocery stores. If you are looking for something to combat dry skin this winter, be sure to try it out!